05.07.2006 For the US launch of the Accoona search engine in March this year Garry Kasparov was the keynote speaker. 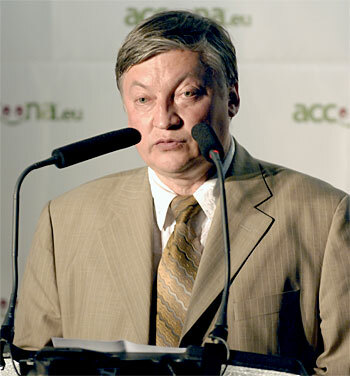 The European launch saw former world champion Anatoly Karpov doing the honors. 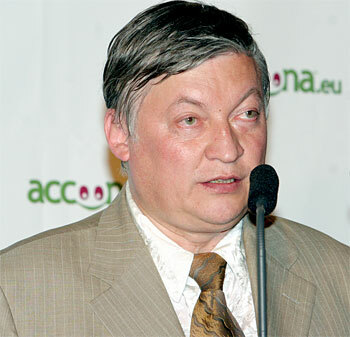 Karpov used the occasion to describe his (and Kasparov's) involvement in the Accoona project, but also about artificial intelligence and chess. 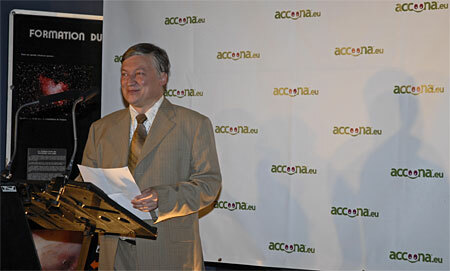 On June 29, 2006, Accoona Corp. launched the first European search engine, Accoona.eu, in Paris. Accoona.eu is billed as the only search engine that provides the user with European specific information in seven languages – English, French, Dutch, German, Italian, Spanish and Portuguese – and three content search categories: Web, News and Business. Due to Accoona.eu’s language preference recognition technology, the language of one’s search is instantly recognised when typed into the search engine. Also, Accoona’s artificial intelligence technology ‘understands’ the meaning of search queries beyond the conventional method of matching keywords, empowering the user to find more relevant information, more easily. "Accoona’s artificial intelligence technology makes finding information on the Internet enjoyable. Driven by enhanced search technologies, Accoona’s search engine gives the power back to the user," said Eckhard Pfeiffer, Accoona’s Chairman and former CEO of Compaq Computer. It’s also great to see the realization of goals that Accoona set out to achieve during its humble beginnings just two years ago – goals which included the launch of one of the world’s most advanced search engines and a search engine designed specifically for the European Union. Today’s launch has reaffirmed my decision to become one of Accoona’s first shareholders back in 2004 and an active backer and tester of Accoona’s unique artificial intelligence technology. At that time, I was drawn to and fascinated by Accoona because I had witnessed first-hand the impact that artificial intelligence technology has had on my professional endeavor – the 500-year-old game of chess. For years, through much of the 20th century, the world’s computer scientists strove to develop technology to rival the workings and intricacies of the human brain. Chess provided a natural platform to test advances in AI technology because chess is undoubtedly one of the world’s most complex games and most challenging test of human thinking and interaction – given the range of moves and machinations entailed in chess competition. And for years, computers simply couldn’t compete with the chess masters of the world. People scoffed at the idea that artificial intelligence could outmatch the world’s greatest chess competitors. Given our connections to chess (and the natural evolution and advancement in artificial intelligence technology since 1997), both Garry and I were naturally drawn to the business potential of Accoona’s AI technology in revolutionizing Internet search. That potential is being borne out by tonight’s announcement and demonstration. Today, you’re seeing the budding fruition of that technology, which will unleash the power of artificial intelligence-driven search for online users throughout the European Union. I can only imagine the educational possibilities that Accoona.eu will create. Thinking back to my early years, I was fortunate enough to learn the game of chess at age four – without access to computer technology. No doubt, with the advances in computers and Internet search today, some young online student, somewhere in Europe, will learn and master the game before that tender age. I’m also convinced that -- with Accoona.eu and its artificial intelligence technology unearthing the wealth of information available on the Web, including the complex and fascinating world of chess – someone just might become a chess grandmaster, and like me in 1974, become the youngest-ever world chess champion. Based in Jersey City, N.J., Accoona Corp. is dedicated to enhancing the quality of online searching by creating sophisticated artificial intelligence search technologies that provide users with a richer and highly relevant search experience. The company has agreements with Dun & Bradstreet, Euro News, FAST Search and Transfer, GuruNet, musicMe, Moreover and Yahoo!. For more information, please go to www.accoona.com.